Hi, looooong time stalker of the forums, first time poster. Disclaimer: I am not an avid follower of the forums and am sure some of these ideas have been posted before. Just throwing in my 2 cents. What has me excited about this game is that Josh seems to be putting a heavy emphasis on economics. Besides Eve Online, a monster I don't want my life to get sucked into, I have yet to see a videogame that does markets well. Few do free markets, but even fewer do realistic markets. I am talking trade tariffs between systems, Regulations and banned goods (Smuggling), Intellectual property, Investments, inflation, corporations, marketing, Interaction between various economic and governmental systems, Trade guilds, and my favorite, market bubbles. I have yet to see any of these in a game so even done one, or somehow, doing all would make the game in itself. Josh seems to be focusing on having independent AI actors which would allow all these systems to emerge themselves. Now realistically, launch costs for rockets would probably outweigh the income granted by most commodities this game will allow you to trade, but screw that, i want a space trading game. Caravaneer in spaaaaaceeeee. Lemme give a few examples of what I am talking about. Each system's government has its own regulations on what is banned, and what is taxed what amount. System A may allow slaves to be traded while alcohol is banned and vice versa for system B. I seem to remember this is planned, and black market transactions (with their associated risks and prices) were planned too. However, is trade tax planned. System A may only charge .5% tax on transactions while another more stringent, maybe Feudal society, has a tax of 10% on merchants. The difference would dictate how you trade. Will there be multiple currencies or one galactic currency? If there are multiple each issued by their own respective government, it would make sense for their prices to fluctuate relative to each other. Money could become a commodity itself, and therefore change in value. If you then start invading or destroying one of these governments, you could trigger hyperinflation. Governments could also perhaps change how much money they "print" And money should over time generally inflate in value in healthy markets. It seems this is already planned which has me so excited. Selling patents? Heck yeah! Own that patent to a drug to cure the epidemic on system A? Profit you capitalist thug! Go manufacture that drug and sell it by the boatload at 1400% manufacturing costs! Or maybe become an inventor. Create weapons, farm equipment, you name it! Procedural generated engineering and tech research allowing you to become an engineering/R&D firm. Perhaps traders unite under a banner, like a guild or a workers union. You as a player could join, or even create and run such a guild. Maybe they charge membership fees to allow you to trade within their jurisdiction, taking their own percentage of your profits too. Failure to trade under their rules or without membership would result in their military retaliation! I am thinking East India Company, a corporation which functioned like a sovereign nation, except in space. They could control and dictated trade with nations, and perhaps you as a player could help upset their monopoly, or you could increase it, monopolizing trade within your empire! This already seems to be a thing you want, but I sure as hell want to be able to hold stock in a company. I want to be able to take out loans to build a factory in system A to create the clothes they so desperately need. I want to be able to invest in AI run companies, giving me some say over them, and perhaps, allow me to take them over, buying them out. Free market for trade + stock market for corporations = win. I would play this game even if the graphics consisted purely of a spreadsheet. THIS IS THE ONE THING I REALLY REALLY WANT. Let's say planet A has a small ice sheet from which it sources its water. That ice sheet only has so much, and it is running out. Additionally, the mining operations on planet A are very profitable, so it is expanding in population rapidly. AI should forsee then that water will soon become in large demand in this market, and assuming it does not get enough trade with the outside world, this should result in a bubble. Water, even before it has actually run out, should inflate in price greatly because people forsee greater future demand and a huge future decrease in supply. The AI shouldn't look at the current demand and current supply, but also future demand and supply. Maybe this outpost knows that traders will bring in water once it runs out, albeit at a higher cost than mining the ice sheet would be. Therefore, AI speculates and increase the price some, but not skyrocketed up to the levels it would be in a crisis shortage. THINK OF THE IMPLICATIONS OF THIS. The player could then FAKE a shortage. Yes, I want to be able to spread rumors and misinformation. I can spread a misinformation campaign on a planet that X will soon be in short supply, creating a market bubble I can exploit for capital gain. That's ambitious to say the least. I doubt such market speculation could become a thing in LT, but if it did, I would throw my money at the screen. LT AI should anticipate future market conditions and adapt accordingly, naturally creating price bubbles. Additionally, not just free markets, broader economic interactions could make this game the best trading sim ever. Yep, this is one of the reasons why I'm so interested in LT as well. I really want to see how smart the AI is and how it responds to information and market demand. If this stuff isn't implemented I'm sure that at least some of these items will get modded in at some point. Only time will tell. Because Limit Theory is a game that has some simulated economy features in it, rather than a economic simulation that happens to be fun, there's maybe a question you might want to consider before getting too deep into specifics: open or closed economy? In other words, should all of the wealth inside an instance of the game be generated directly by the productive activity of actors inside the game world? That's a closed game economy. Or should wealth (including but not exclusively money) be magically generated by "faucets" and removed from the game world through "drain" features? This is an open game economy. There are all kinds of fun theoretical distinctions between these two options, but the most important distinction is practical: open economies are a lot easier to implement in games. When you're a small team with literally thousands of design decisions that have to be implemented as working code, it is not always obvious that a closed economy is the better choice. Closed economies are notorious for certain kinds of inherent problems. For example, how do you structure the economic laws of this closed system to minimize mudflation? That's normally more of a problem in a multi-player game than a single-player game such as Limit Theory, but it may be applicable to LT because Josh may want NPCs to be nearly as independent and capable actors as the player's character. So if NPCs can transfer wealth among themselves, not to mention creating and destroying wealth, what dynamic systems can be imposed (or allowed to emerge, which is a whole 'nother conversation) to allow those activities without also enabling severe inflationary or deflationary periods spanning large areas of the game universe that prevent the human player from enjoying the economic subgame in Limit Theory? You're keen on "market bubbles"; you may be thinking, "No, I want inflation and deflation to happen in various places, and for the economies in those places to suffer plausibly from those effects!" But now you're saying simulation > gameplay. I'm 100% cool with you wanting that, and I'd be thrilled if you could get it in LT without degrading the preference of other players for gameplay > simulation. Soooo... how does that happen? Are there any games out there where the AI runs the economy? If so how does the AI keep the value of items balanced? I'm not an expert on game economies so this is just my take on the subject. Obviously I would prefer a closed economy to exist within Limit Theory where everything is real; and to a point I believe this may occur. But I've also read a number of the development logs and it would seem that LT will in fact have an open economy where planets generate and drain resources from the market. So maybe that's the best of both worlds. Every civilization originates from a planet which generates population and some resources. From there miners begin mining asteroids and explorers begin hunting for new mineral sources which are used to construct space stations and factories. As factions expand, prices vary on the amount of resources available and their uses. Piracy becomes a profitable option and most resources shift hands as opposed to being sunk into planets. As time elapses additional resource sinks could crop up in the form of maintenance costs for structures and vessels. These additional costs should help stabilize the economy far into the "end game". Granted that Limit Theory really shouldn't have an "end game". A closed economy does not work with a game with an infinite number of systems / economic hubs. It just needs to be interesting and believable to the player at his current location in game-space. Or: every economic interaction is concentrated and limited to a specific cluster in space. Where the number of clusters can be infinite, but they have no measurable interaction. A "Gameplay <----+----> Simulation" slider, if more than just a meta-slider (controlling the state of other sliders), would be something. 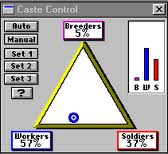 but replacing Breeders with "Story," Workers with "Simulation," and Soldiers with "Gameplay." (In other words, Aesthetics, Dynamics, and Mechanics.) This represents the fact that because programming hours are finite (assuming you're determined to release the game), if you want more of one kind of feature you have to forego implementing some other kind of feature. You can try to balance features, but at the risk of players who enjoy a particular kind of feature complaining that you failed to deliver enough of it. To have a slider that could alter this balance on the fly would be pretty neat. But the reality, I suspect, is that such a thing is not within anyone's capabilities today for a game of any meaningful complexity. If you want more gameplay than simulation, then that's how you have to design and code the game explicitly from the very start, and that's the game you deliver. Abusively sub-optimal socioeconomic systems are well within the range of possible systems that we might expect to see generated in a highly procedural universe. That you think I'd disagree that "completely unregulated free market capitalism" is "abusively sub-optimal" just points out that you think I'm more of an absolutist than I actually am. Seriously, I see the flaws in all systems. My gripe is only with those who think their preferred system is somehow immune from human limitations! It would be interesting if Limit Theory could be used to teach students why certain regulations help an economy while others hurt it. Or even just have Limit Theory be the test bed for simulating various forums of government and how long each type lasts before burning out. Then have the ability to apply regulations to particular factors such as trade, and experiment with the outcome. This level of simulation might be a little farther than Procedural Reality Inc. want to go. Back in 2013 (! ), I suggested some ideas for "fixed research nodes" that included conceptual advances, applicable to a whole civilization faction, such as Medicine, Mass Media, and Diplomacy. One important note that I would like to make about how tech works (that also influences the way the tech tree will be designed) is: all applied technology corresponds directly to a type of game object. This is both a conceptual as well as an implementation simplification. So, for example, "concepts" as leaf nodes won't work - "networking" and "parallelism," for example. However we can trivially convert those to "network processors" or "parallel processors," for example. But since they're distinct technologies, the implication is that the objects are distinct as well, so it means we would need to carefully define what makes a network processor different from a parallel processor, again just for example. This was about things that characters can research, not factional organizing systems. So maybe political systems will be hardcoded into the game for factions. OTOH, hardcoding applied tools (and government forms might be considered a kind of tool) would seem to go against the presumed intent that things in the world come from someplace; they don't just pop into existence out of nowhere. So at this point I have no idea whether system-spanning factions having different government types is something Josh & Co. want to implement. The one thing I can say is this: if different government types are implemented (or emerge), and they have different functional characteristics -- distinctive effects on gameplay -- then I think it's important that the numerical values of those characteristics are exposed to the player for editing. Brian Reynolds and the team at Firaxis that made Sid Meier's Alpha Centauri did this. Although they worked to produce what they thought was a balanced game, rather than imposing their personal beliefs about political and economic systems on all players of SMAC, they exposed many of the controlling values of the game as XML files. If you thought Nerve Stapling should have higher negatives, or that Capitalism should not be the most-penalized economic option, you could change those values. If it honked up the balance of play, that was on you, but Firaxis trusted players to make that call for themselves. I think that's a good principle to follow for anyone making a game that references real historical social, economic, and political systems of organization. The two really go hand and hand don't they though, simulators try to be realistic, games with good gameplay try to have good game balance. I've always been looking for an economic simulator like that, but do understand that it's really beyond the scope of a game like this, which will put both sliders closer to the gameplay and game balance side. That said, that doesn't mean implimenting some of these principles wouldn't be cool. Market simulation wouldn't need to be too immensely complex. Instead of a completely interconnected web, it could be hierarchical. That idea of clusters really saves your skin here. Ships and planets in a system are one level, next level is systems interacting with other systems (And probably factions are at this level too), then we have clusters of systems interacting with other clusters. Each layer only interacts with the layer above or below it one to one. What would this look like in game from a simulation perspective? Say you're in a system with 3 habited planets and 100 or so ships around it. The economic activity of those ships is simulated, as is the economic activity of the 3 habited planets. The cluster has 63 habited systems, and their interactions, as well as the interactions of those factions are simulated. The interaction between ships in the other 63 systems doesn't need to be simulated right now because from this distance it all sums up to one force. Same with far away clusters, they may hold over a hunderd systems each, but when you aren't their, the economic activity of each can be thought of as a single object interacting with other clusters. If the universe is big enough, galaxies can become their own megaclusters interacting with other galaxies through singular forces as well. (Or local groups too if you go that far). At each level, other objects act as single faucets and sinks. So yeah, of course we can't have a pure closed system on this scale, but they can scale with size just like floating point numbers. I think that's a core game design principle or something. Things don't exist until you look at them, and aren't well defined until you squint. Let's just say I'd prefer an economy where I can buy for less and sell for more... ...it quickly gets boring if everything has a fixed price.